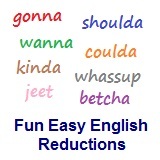 ﻿ Fun Easy English - new-american-english-reductions-reduced-words-topic-word-you-got-you-gotcha. In this lesson you will learn the American English reduction gotcha. She gotcha a new pair of pants. He gotcha more of your favorite dessert. He gotcha a ticket to the show. I actually gotcha a lot more money. This idiom is used often in native English conversations. Reductions, such as gotcha are not real words in English. Jessica Hilda Mauboy (born 4 August 1989) is an Australian R&B and pop singer, songwriter and actress. Born and raised in Darwin, Northern Territory, Mauboy rose to fame in 2006 on the fourth season of Australian Idol; she became the runner-up and subsequently signed a recording contract with Sony Music Australia. After releasing a live album of her Idol performances and briefly being a member of the girl group Young Divas in 2007, Mauboy released her debut studio album, Been Waiting, the following year. It earned Mauboy her first number-one single "Burn", became the second highest-selling Australian album of 2009, and was certified double platinum by the Australian Recording Industry Association (ARIA). This video is a good example of the usage of "gotcha", an English language reduction. I'm feeling, I'm feeling your love. Cause we're running, running the world. By the collar and you're coming with me. In my pocket where I want you to be. But it's all just an act! Are you feeling the feeling my love? I gotcha where I want you to be!